“Diet has been known to be the key driver in shaping the gut microbiome. Indian population has diverse lifestyles and food habits and so far, the Indian gut genome is not well explored,” states Vineet Sharma, scientist at Indian Institute of Science, Education and Research (IISER) Bhopal and a member of the research team who performed the study. India also has the highest prevalence of diabetes in the world, with 53% of deaths in India attributed to diabetes and cardiovascular diseases. India thus presents an interesting case study to understand the interplay between gut, diet, and health. In this first ever large-scale study, Sharma and colleagues analysed the microorganisms in gut of 110 healthy individuals to uncover the microbial diversity in India. 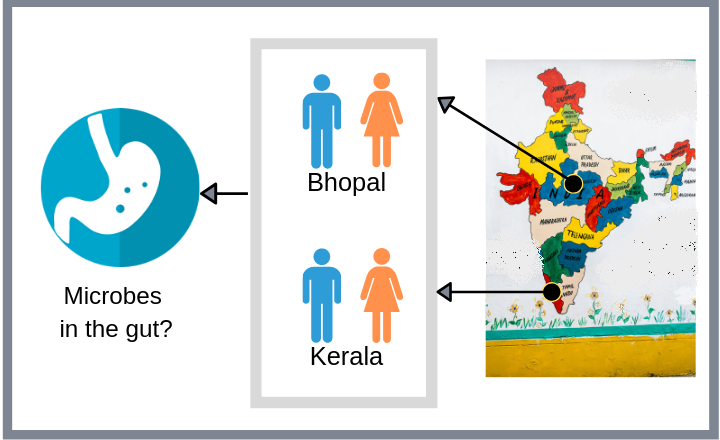 The researchers sampled individuals from two locations with distinct diets: Bhopal in the North-Central region and Kerala from the southern part of India. The Bhopal population predominantly consumes a carbohydrate-rich diet, including plant-derived products, wheat and trans-fat food (high-fat dairy, sweets and fried snacks), whereas, the Kerala population commonly consumes an omnivorous diet comprising rice, meat, and fish. Researchers collected faecal samples from the volunteers, froze it within 30 min of collecting, and used it to sequence the microbiome (the combined genetic material of all the microorganisms present in a sample). A common method used for such purpose is sequencing of 16S rRNA gene. This gene consists of a region that is variable in different microorganisms, allowing the classification of different microbes. Using this analysis, the researchers found a total of 943,395 genes that were unique to the Indian microbiome. The microbiome of Indian population was also compared to the microbiome of other countries, such as USA, China, and Denmark. “One of the most interesting results was the much higher levels of Prevotella species in Indian gut microbiome compared to the other populations,” says Sharma. Prevotella has been previously observed in communities that consume a plant-rich diet and is associated with vegetarianism. “Both branched chain fatty acids (BCFA) and short-chain fatty acids (SCFAs) play an important role in the maintenance of health and elevated concentration of BCFAs may trigger the progression of different diseases,” says Bhabhatosh Das, a scientist at the Translational Health Science And Technology Institute (THSTI) who was not associated with the study.